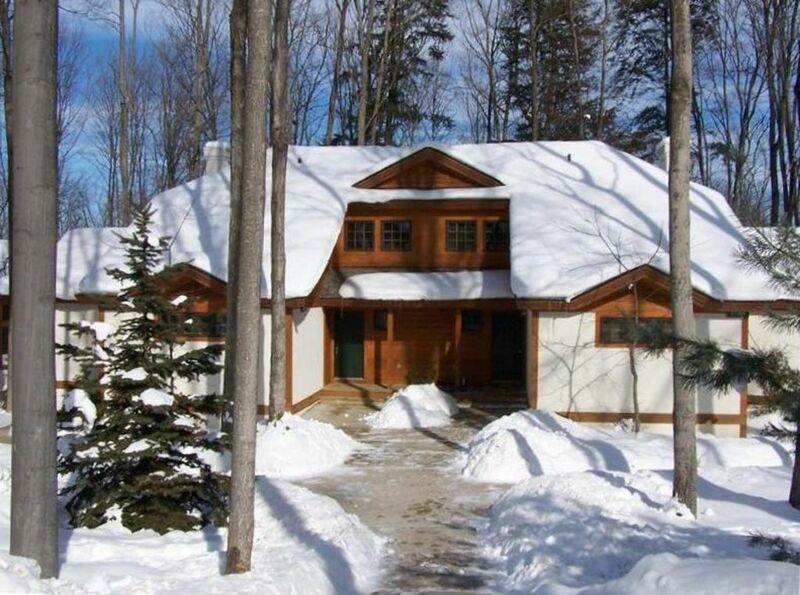 This condominium is tucked into the woods and is a Ski-in/Ski-out right on Boyne Mountain Resort in the Disciples Village Development. It is located across the street from the Disciples Chair Lift (approx. 50 yards). The golf courses and Deer Lake are approximately one mile down the road. You get the best of both worlds!! The condo has 4 bedrooms and 4 bathrooms. The master suite has a king bed, hutch with TV and private bath with a jetted tub. The other main floor bedroom has 2 queen size beds with a bathroom right outside the door. The upstairs loft has 2 queen size beds with a bathroom as well. The lower level bedroom is equipped with 2 queen beds with its own bathroom. There is also a set of bunk beds off the living room area. The condo has 2 kitchens that are fully equipped with coffee pots, toasters, microwave, refrigerator, range, dishwasher, dishes and cooking utensils. The upstairs living room has a gas burning fireplace with TV and DVD player. There are lots of windows and an incredible view of northern Michigan from the living room. The unit also has a deck off both living rooms. The lower level living room has a TV with DVD player as well. The condo has FREE wireless internet access, air conditioning, and a washer and dryer. Boyne Mountain is a golfer and skier's paradise offering the top-rated skiing and snowboarding and golf courses in the Midwest. Boyne also has the largest indoor water park in the Midwest, tennis courts, Deer Lake/beach and several dining options. Golf, skiing and snowboarding lessons are available and so is childcare. Boyne also offers many other activities such as disk golf, zip lining, paint ball, segway tours, golf cart rentals, bike rentals just to name a few. If you have trouble deciding on which condo to choose, give me a call and ask whatever questions you have. I promise to give you a very competitive rate if not the BEST one you will get. We have many repeat renters because we offer great prices and are great to work with. Note: We also rent another identical unit that is located right next door to this one. vrbo #921040 is our other unit. The washer and dryer are in the lower level unit and only. It only comes with the 1 and 3 bedroom option. It does not come with the 3 bedroom option. Personal items like soap/shampoo/lotions are not provided. We love our Boyne Condo and try to make use of it as much as we can. We love skiing in the winter. We take advantage of golf, swimming, and biking in the summer. Our Boyne condo allows us to maximize our family time together. Our condo is just a few steps from the ski run. No need to drive or haul ski equipment once you're here. The beach in the summer is a hidden gem. Nice and shallow for small children, free beach toys, paddle boats, shuffle board and even a putt-putt course with real grass. Parking is located directly in front of the condo. There is dining areas on both the main floor and lower level floor.